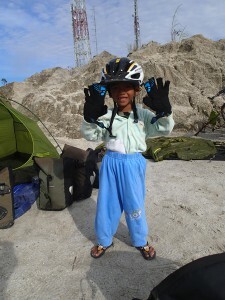 Home→Indonesia→Hallo Mister! How are you tomorrow?! Hallo Mister! How are you tomorrow?! And so goes the standard greeting in these parts. Mixed gender and timing particles abound, but it matters not, as the sentiment is true and the accompanying smile lifts the spirits of weary cyclists. I have collected so many stories over the last week that I could fill ten blog posts and still have some to spare. Don’t worry, I will give you the Reader’s Digest abridged version, focusing on our camping experiences, and make sure there are plenty of pictures to relieve the monotony of text. 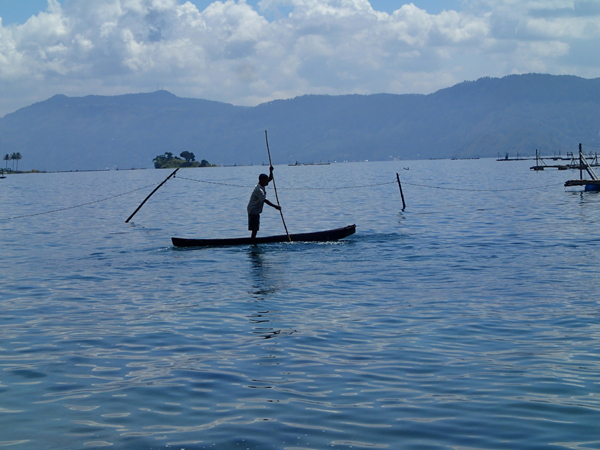 A vew of Lake Toba and Samosir Island. Around every corner there was a vista worthy of a postcard. 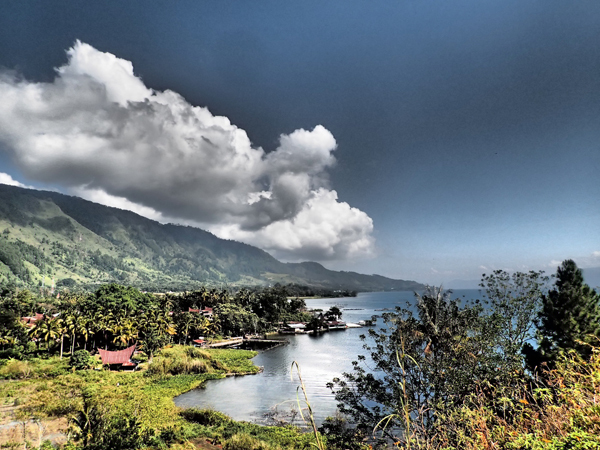 We departed Lake Toba and had a wonderful time riding around the northern side of the island, drinking in the spectacular views and the making friends with hospitable folks we met along the way. It was a bit later than planned when we began our climb out of the crater and, unfortunately my legs just weren’t up for the 600+m vertical ascent. After a couple of hours of grinding away I was spent and running out of light. 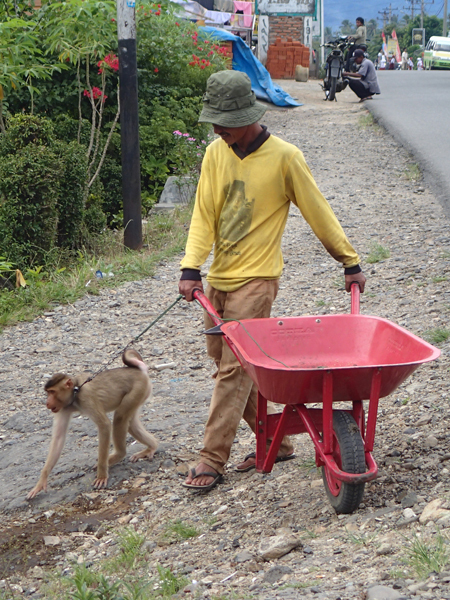 We flagged down a little truck and managed to convey to the driver that we’d appreciate a lift to the top of the hill. After replenishing our water supplies with some dodgy coloured boiled water from a little restaurant we set off in search of a campsite before the light disappeared entirely. In most rural areas is Asia all the flat ground is used to grow food and a suitable campsite was proving difficult to find. 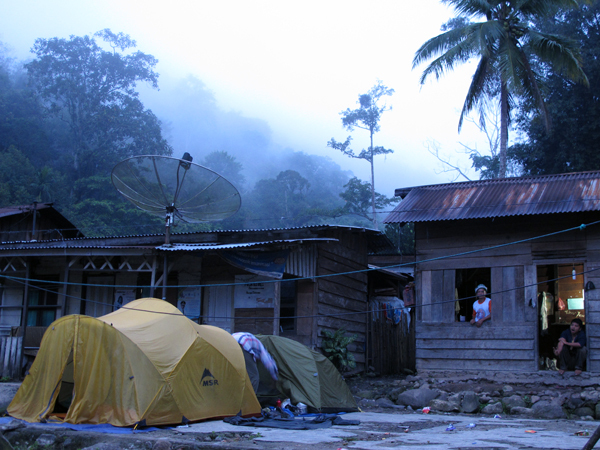 We opted to camp in a church/school yard in a small hamlet and found the locals more than happy to have us there. 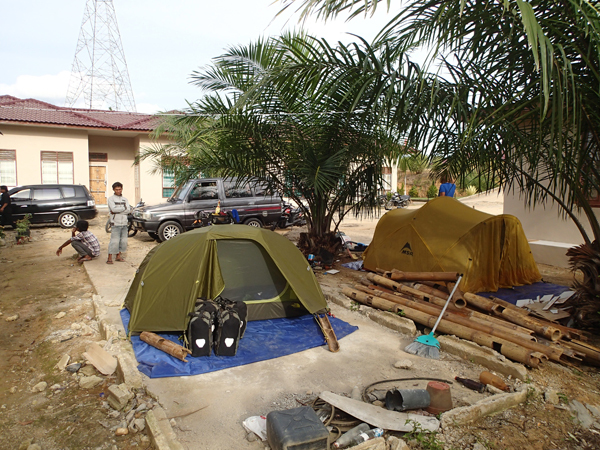 We quickly put up our tents surrounded by children all keen to see what was going on. It was a bit of a relief when their parents called them home and we could get a move on with cooking dinner. The next morning all the kids arrived at school and began setting up for a concert. 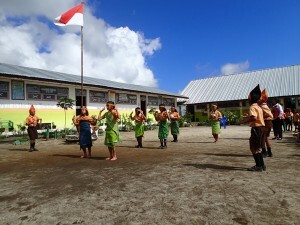 It was a real treat as they played traditional music and performed some dances for their parents as we watched on. Before long we were invited by the principal to join in and everyone had a great time laughing with us as we attempted to copy the dances being performed rather expertly by the children. A wonderful performance of traditional Batak dancing by the children. 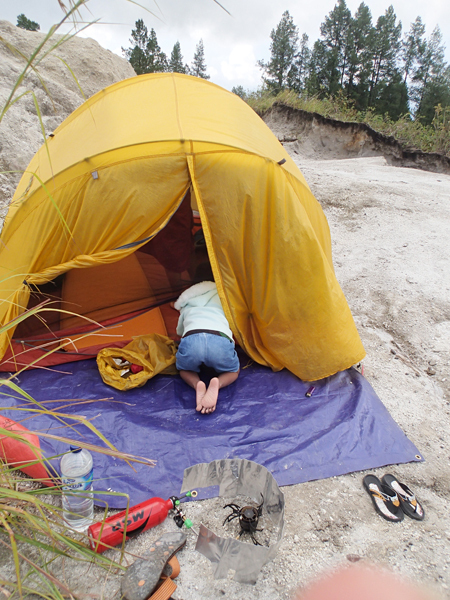 The next campsite was in a sand quarry next to a group of restaurants – yes, that is the way they roll here. 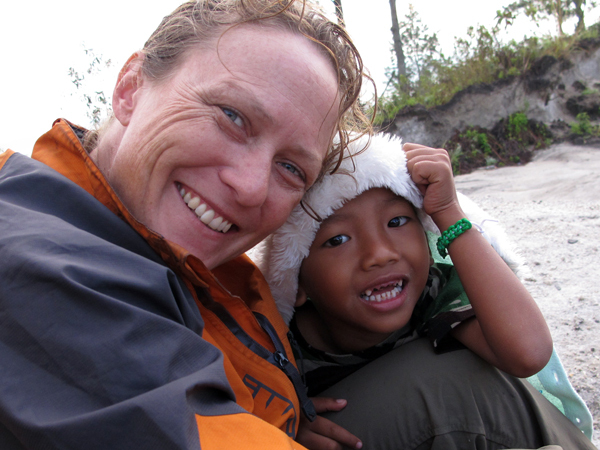 When we arrived a little boy raced out of one of the restaurants and gave me the most beautiful hug. In lieu of his actual name, we decided to call him Huggy, which, by the time we left he was responding to without hesitation. 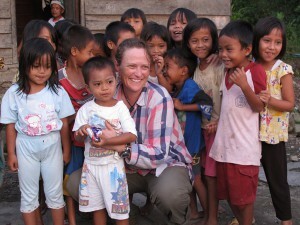 The children living in the restaurants were curious as to what we were doing and spent a lot of time observing us. Huggy was a great helper and very proudly held poles, pegs and groundsheets for us as we set up. 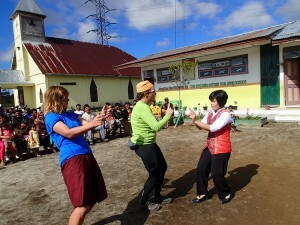 Pretty soon, the locals had called on a cousin who spoke English to come and find out what we were all about. His English was pretty awesome and he was very helpful translating all the usual questions and answers: where do you come from? 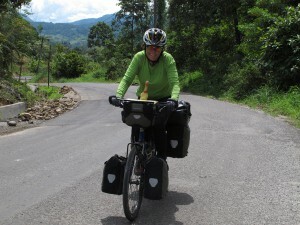 Why are you cycling? Are you married? Why don’t you have children? Etc. Huggy snuggling up for another wonderful cuddle. Such a good little fellow. Further down the road, and our next campsite was within the bounds of a village. We originally wanted to camp just outside the village but were advised that a pig occupied that space and it wouldn’t be any good for us (fair call). 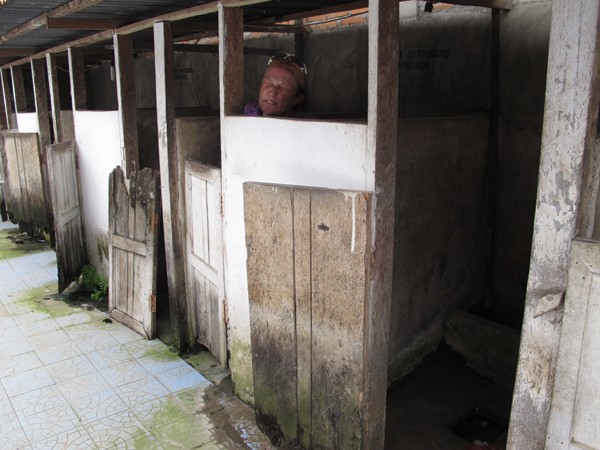 The villagers very kindly offered us some space next to their houses and let us use their bathing facilities, although the girls were overly interested in observing us washing, keen to see if we had any strange bits attached to us. For the entire time we were up, we were surrounded by curious people watching our every move. The women were particularly interested as Monika prepared our meal, and when it came time to eat it, only a few brave souls gave it a try. Overall they thought the food was a little strange, but agreed that it wasn’t poisonous as not one of them dropped dead on the spot. That evening we gave an impomptu concert, with Monika playing the ukelele and me joining in on vocals. Despite the dreadful sounds coming from my mouth, the locals thought it was wonderful. Bless them. Everyone watches on as Monika prepares our dinner. 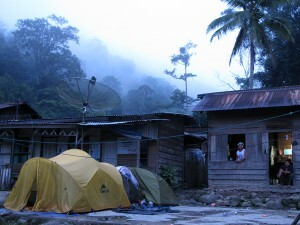 Our next camping spot was just outside the massive town of Padangsedampuan, which was a bit of a culture shock. 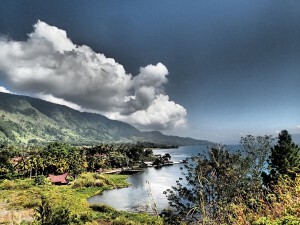 Traffic everywhere, spewing forth clouds of fumes that we were unaccustomed to after traversing through the jungle valleys leading up to it from Lake Toba. After stopping for supplies at the local market, we headed out of town, keeping an eye out for a viable campsite off the main road and away from the darn traffic. We peeled off down a side road and spied a good spot next to a government building (which turned out to be the land title office). Next to the office was a little restaurant and the female owner immediately took our side in negotiations with the boss as to whether we could get permission to camp there. She was great, and the boss-man soon caved in. 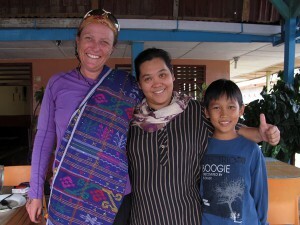 We were hustled inside her little restaurant for strong coffee and some pisang goreng (delicious banana fritters). I have to say it was nice to set up camp with only a handful of observers, and no kids getting in the way, although I wouldn’t trade the previous experiences for anything in the world. Our camp at the land title office, only a few watchers. 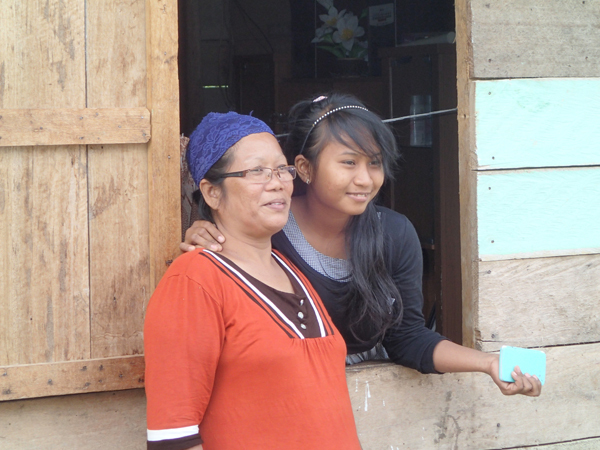 Aside from the time spent with the people of Sumatra in the evenings, very few minutes pass on any given day without interactions with the folks living along the way. Everyone we pass says hello (usually “hallo missster!”) and waves and smiles at us. The kids chase us down the road, calling after us. There are more smiles, waves, thumbs up and high fives than there are stars in the sky (okay, so that’s possibly an exaggeration, but I dare you to cycle through Sumatra and keep count along the way). One little kid only knew “Thank you” in English, and it sounded a lot like f-you at times, and he kept calling it out until we were out of earshot and possibly longer still. 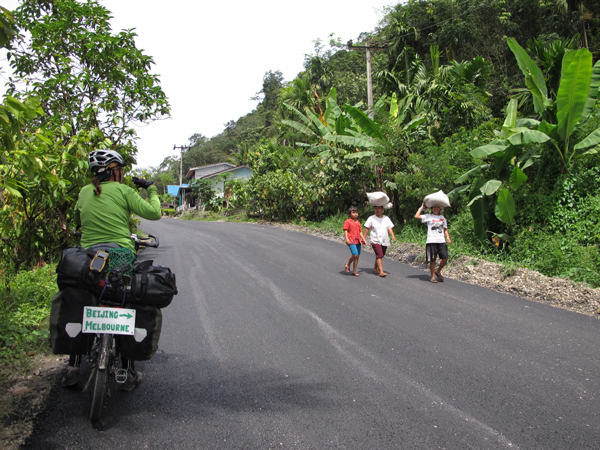 When vehicles pass, they often slow down to say hello or smile or wave or even take photos of us pedalling along. 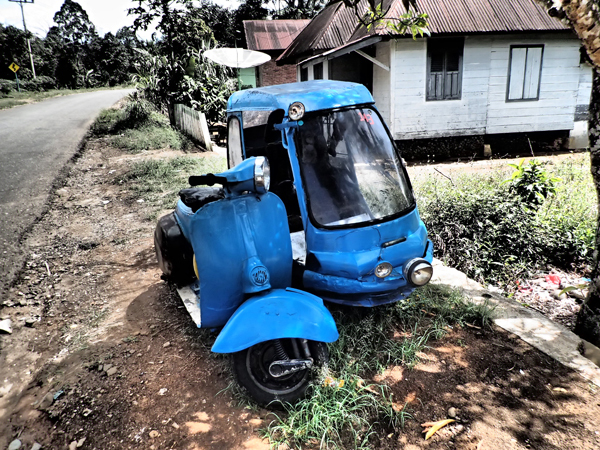 On-coming vehicles usually have tinted windows and the only thing you can see is the drivers pearly white teeth in the shape of a smile – that’s my favourite, I think. If you are thinking of cycling through Indonesia, you mustn’t miss Sumatra, it’s just amazing. 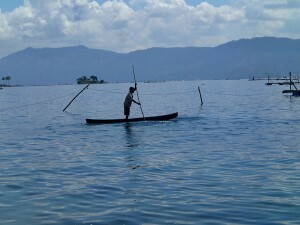 A boatman out checking his nets on Lake Toba. 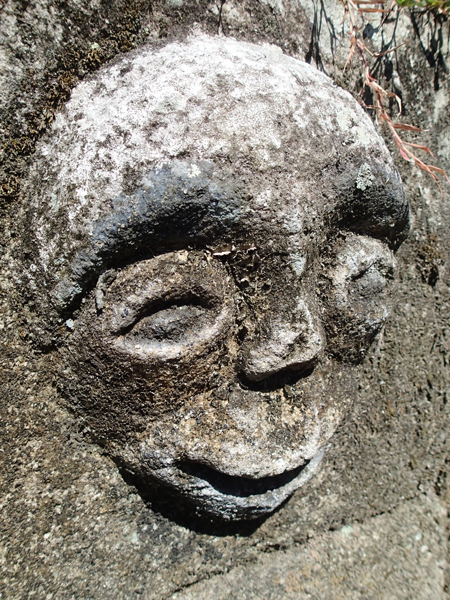 A rock carving on Samosir Island, Lake Toba. 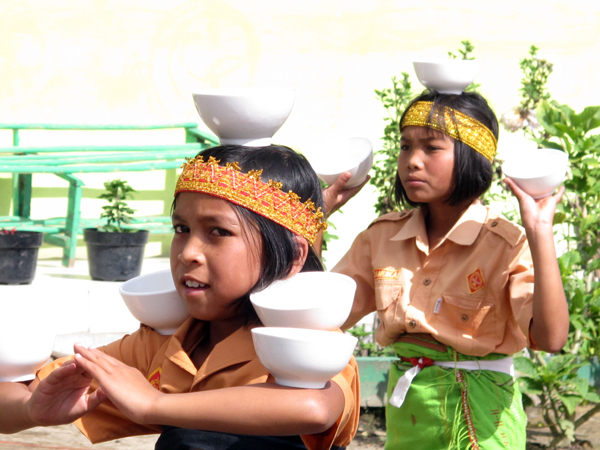 Full concentration required for this particular dance. If I’d tried this there would have been broken crockery everywhere. All set up for the school concert. Oh, dear. I’m no expert, but the laughter was enough to suggest we shouldn’t give up our day jobs. 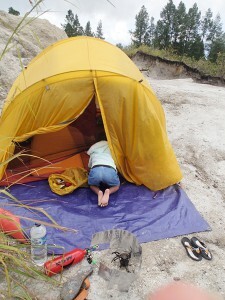 Huggy helping Monika get everything organised inside her tent. Huggy is all set to hit the road with us. Smoothing the way for our request to camp in their village, Monika belts out “Hotel California” on the ukelele. In the early morning, only a few folks are keeping an eye on us. 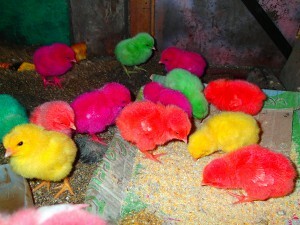 They spent much of the early morning shushing the crowing roosters so we could ‘sleep in’. 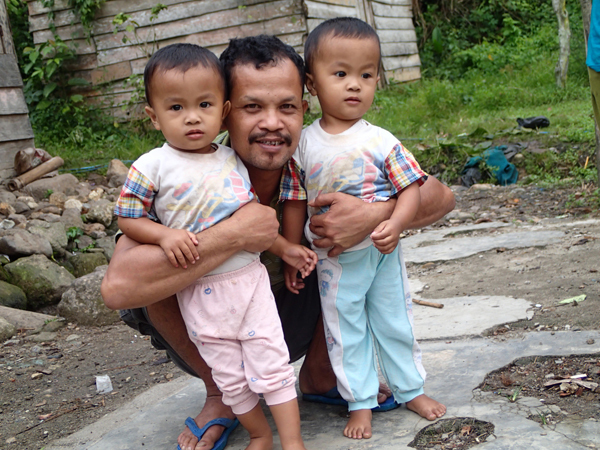 What happens when the twins are asked to pose for a photo with a foreign devil. Posing for the umpteenth photo with the kids. Mala, the owner of the restaurant near the land title office in Padangsidempuan, and her daughter Anna-Sofia. Our wonderful hosts, and me in a rather awkward pose. Struck to make sure I was in position when the delay timer activated… I swear. 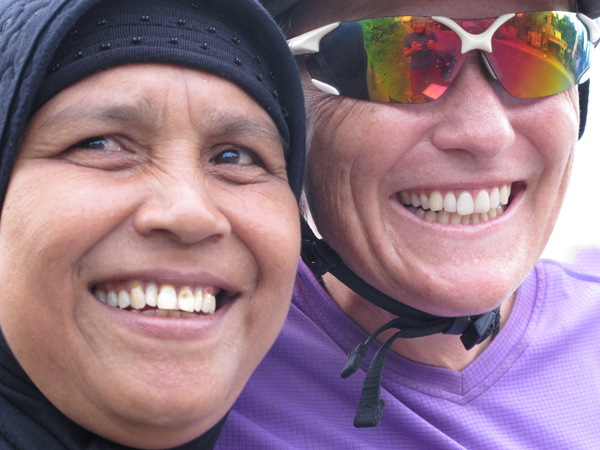 Beautiful smiles everywhere in Sumatra. Shy. 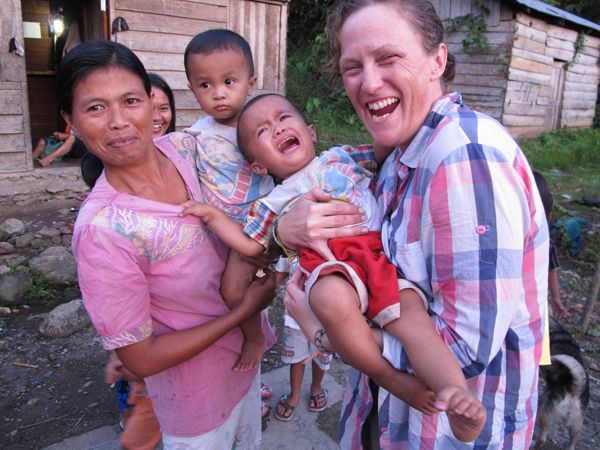 Not everyone is keen to get their picture taken with the foreigners. A wonderful gift from a random stranger. A traditional Ulus, that Batak people wear for ceremonies. A wonderful old chap came in to a restaurant where we were having lunch to find out what all the fuss was about. Despite his protestations, his English was pretty darn good. 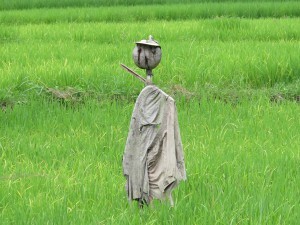 A scarecrow watches over the rice crop. Sweating up yet another hill in the jungle. Despite the strain, life is pretty great. Ahh, memories of the Royal Agricultural Show. Who remembers seeing chicks like this when they were a kid? 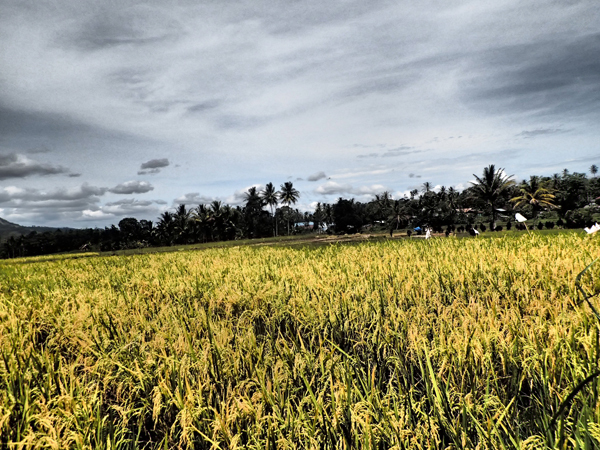 Golden fields of rice. 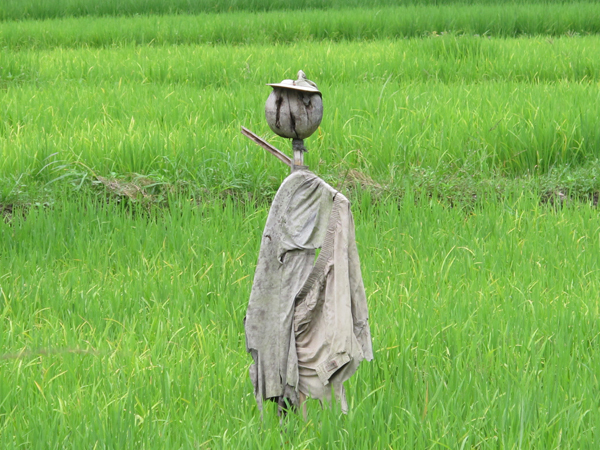 You know you are in Asia when this sight greets you around every corner. 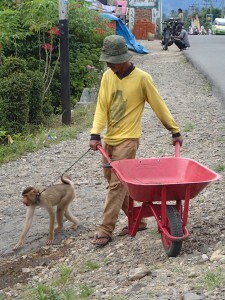 Monkey! “Monette” in Bahasa Indonesia, finishing with a strong ‘t’ sound and your tongue sticking out through your teeth. Give it a go! 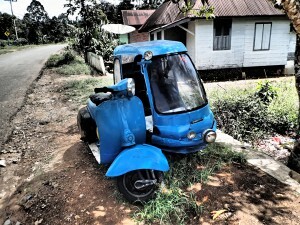 A dinky little Sumatran tuk-tuk. After finishing a looooong climb we were greeted by this sight. It felt like we could see all of Sumatra from this vantage point. I hope this post finds you smiling at everyone you see, and enjoying the company and kindness of the strangers that soon become your friends. Seriously wish you could be here with me to experience this! Beautiful story, Jane. Made me feel warm and fuzzy. You truly have a gift for writing! Have you ever considered turning your stories on this site into a book or a travel novel, or something like that? I would be your first fan!! You think you’re alone now? Please DONATE now to help me reach my target of $50,000!